New and experienced managers alike typically repeat behaviors they observed or were subjected to when they were employees, which perpetuates unhealthy and unproductive management methods. 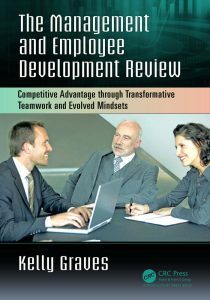 The Management and Employee Development Review: Competitive Advantage through Transformative Teamwork and Evolved Mindsets combines accepted psychological theory with practical business reality to help managers to get the very best out of themselves, their employees, and teams. This book reiterates that organizations are only as good as the people within them, and these people must be hired, trained, coached, and promoted in the right way, with focused intent, so the organization can learn, improve, and grow. This book provides a step-by-step game plan to help organizations develop employees with an eye toward sustained excellence. If employed correctly, the principles in this book will transform not only your business, but you as well.